Dynapack™ chassis dynamometers are such a radical departure from the stereotypical roller dyno that it really is in a class of its own. Most of the previous assumptions made about traditional dynamometers simply do not apply to the Dynapack™ series. In fact, you will discover that we give you tools and capabilities that have previously been thought impossible to achieve on a chassis dyno. Dynapack™ allows you to quickly and accurately measure engine, drive line and other performance data, with previously unseen sensitivity. Dynapack™ attaches directly to the axle(s), thereby overcoming all the disadvantages of tire distortion including noise, torque steer, loss of traction, tire heat and design variations in the tire. It's ability to conduct multiple runs back to back and provide amazing levels of repeatability. Runs must be repeatable to within three-tenth's of one percent before the Dynapack™ is allowed to leave the factory for delivery to the customer. The lack of inertia in the Dynapack™ system allows the sensitivity to be greatly improved over traditional dynamometers. We can reliably measure minute differences. Many world class OEM manufacturers as well as tuning houses rely on the Dynapack™ and it's amazing sensitivity to develop their products. One large reason for this because a Dynapack™ eliminated the largest variable of all: the tire to roller interface. Rubber tires don't hold traction against a steel roller very well, add a year or so of use, and the rollers become polished by the tires and traction decreases further. When you have this variable link in your data chain, you cannot have guaranteed repeatability. Sure a roller dyno itself may be repeatable, but as soon as you put a car on it, all bets are off. With the Dynapack™, we use a direct mechanical coupling to make absolutely sure that there is no loss, no slippage, and no inconsistencies in this area. The Dynapack™ is absolutely the most consistent and repeatable chassis dyno in the world. The first and most obvious difference is the elimination of the tire to roller interface on a traditional roller dyno. The Dynapack™ eliminates this variable by using a variable fit hub adapter that provides direct coupling to our power absorption units. There can be no tire slip, no rolling resistance, and no chance of the vehicle separating from the dynamometer at high speeds. Notice that we call this a variable. Tire temperature, tire pressure, tire traction, etc. are all variables that can change not only from run to run, but during the run as well. Throw an unknown variable like this into the equation and your data has now become subject to potential of a high margin of error. It is obviously better if this can be eliminated, which is what Dynapack™ had done. What you end up with a traditional roller designs is a giant, heavy flywheel attached to your engine. The inertia is such that just trying to accelerate the mass of the roller is a substantial load for the engine. Will your measurements be affected by being subjected to this large heavy flywheel phenomenon? And will small fluctuations in power delivery be easily noticeable? In a word, no. The flywheel effect tends to take small rapid fluctuations and smooth them right out. This is great if you want your power curve to look like a smooth pretty line, but it doesn't give you much insight into what is really occurring. What if you eliminated the flywheel effect? Whilst every spinning mass has some inertia, when compared to the total mass of the wheels, tires, rollers, and other associated hardware in a traditional roller dyno, the inertia in the Dynapack™ is practically zero. This allows us to precisely measure and display tiny rapid pulses and oddities that you may not have ever seen otherwise. Another benefit of having virtually zero inertia is the ability to change the rate of acceleration at will. In many simulations, you may want to make the vehicle accelerate at a different rate to simulate a specific condition. With a few simple keystrokes, we can allow the vehicle to accelerate very quickly, very slowly, or anywhere you'd like in between. Because of the lack of inertia and the total control we have over the axle speed, we give you choices. And as you know, choices are good! This makes Dynapack™ an outstanding choice in chassis dynamometers whilst establishing a new industry standard. Inertia is the resistance of any physical object to any change in its state of motion (including a change in direction). In other words, it is the tendency of objects to keep moving in a straight line at constant linear velocity. Which for a lot of tuners this could make it easy to overlook problem areas such as slight knock, missfire, or missing out on an ever so slight power gain because the engine wants more timing in a couple cells. You may want to add or remove a degree of timing in a problem area but you simply can not see it thanks to inertia helping the motor push through it and giving you a smooth map. On the street these issues will not be masked and this could lead to problems since the vehicle/drivetrain will not have the same load (Thanks to inertia) as it did on the drum/inertia type of dyno. 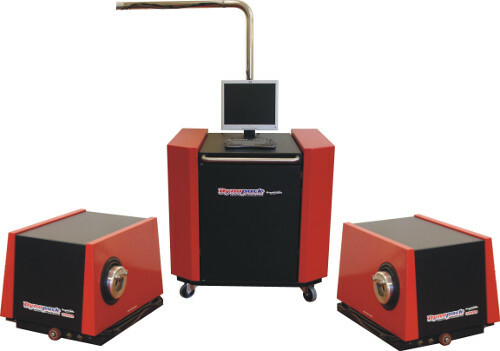 The most obvious application for a chassis dynamometer is to generate a torque and horsepower graph. Everybody does that and we do as well. In a situation where you might be selling dyno time to a customer, the customer may just want a “number” - or a peak horsepower number so they can feel good and tell their friends. Many people look at chassis dynamometers with only this application in mind. The Dynapack™ is capable of so much more. It is a serious diagnostic tool that serves many purposes. In this section we will show you some ways to use our product that you may not have previously thought of. Keep in mind that many of these applications are not possible on our competitors’ products. The Dynapacks™ Software is so sensitive it can see the drop in power when the vehicles fan starts up! In this comparison screen you can see the impact of the fan on the acceleration rate, which happens when the green power line flattens, drops then continues to rise again. This can also be seen in the second graph. The yellow and green pointers indicate where the effect starts and the loss it generated. The corresponding data to those points is displayed directly below the graph, with the loss displayed as a negative number in the blue gain box. Note: Runs are colour coded in order of colours on the left side of the screen - red for the first run, green for the second, etc. This is similar to the traditional dyno acceleration run. You specify a minimum (starting) RPM and a maximum (finishing) RPM for the run. On our dyno, you also decide how fast you want to accelerate between these points. Most other chassis dyno’s force you to accept their rate of acceleration and live with it. We can precisely control the rate of acceleration to your specification. This is extremely useful for tuning purposes. We also hold the vehicle RPM at the starting point (called initial settling time) for a user specified period of time so the vehicle will be stabilized before starting the run. Once the dyno releases and allows the vehicle to accelerate, it will be perfectly consistent in doing so every time. Other dyno’s require you to be consistent in your application of the throttle at the beginning of the run - adding another human error factor in the mix. We now have three different operating styles in the Autoplot mode - allowing you to choose the style that suits your needs. We have two types of step programs that step and hold the engine through the operating range - similar to the way most engine dyno’s operate. We also have a Ramp program that allows linear acceleration between two points in a specified period of time. Once the Ramp Time is chosen, the vehicle will accelerate at that rate regardless of the throttle position (above a minimum of course). Having total control over the rate of acceleration opens up a new world of tuning and diagnostic possibilities. This mode is ideal for drivability tests and diagnosis of load related problems such as hesitations and misfires. By inputting a fixed load level (think of it as an infinitely long hill, where you can adjust the steepness of the grade) you can vary the rate of acceleration at will. This load is consistently repeatable and has a very fine degree of adjustment. The load value ranges from practically no load at all, to a maximum load that will stall just about any vehicle. You can now accurately adjust “tip in” fuel or accelerator pumps or any other “transient response” type of device - and any other parameter where rate of acceleration and load is an important factor in recreating the real-world experience. In the above screen, the white box shows the load value chosen - it can be keyed manually, or adjusted with the up and down arrow keys. The 0 value shown means there is no load currently applied and is the default setting. This data can be exported for use in other programs such as Notepad or Excel. In this mode, you select a specific RPM point where you want to hold the vehicle. The Dynapack™ will continuously vary the load to hold the RPM at that point within one RPM at the axle. As long as you are above the minimum throttle setting that is required to achieve that RPM, you can apply as much throttle as you want and the RPM will not rise above that point - all the way up to the full maximum rated torque capacity of the dyno. The dyno will then display the real-time torque and horsepower being absorbed, as well as other real-time relative data. For example, let’s say you want to adjust the fuel mixture at 75% throttle and 4250 RPM. You would then input the RPM hold point and bring the throttle up until the dyno is holding the speed, and you have reached your throttle setting. The dyno will hold this RPM point for as long as you like. You can now gradually adjust your fuel mixture at that data point and directly see the results of your actions. All of this is happening even though the vehicle is not accelerating. Once you have found the maximum torque at this data point, you are ready to move on to the next data point. The tuning of fuel and timing maps that appear complex are now easy to work through and can be optimized without guesswork. This cannot be said about any inertia dyno. The Dynapack™ is much easier and more precise than trying to make these adjustments while the vehicle is constantly accelerating, or by making a change and doing an entire acceleration run, then another change, then another run, as some of our competitors have to do. Our method is faster, easier, produces more consistent results and can be precisely duplicated at any time. If serious tuning and real results are your goal, there is no other chassis dyno in the world that can compare with the Dynapack™.